Every year your local health department investigates certain cases of mosquito-borne disease. The best way to prevent mosquito-borne diseases is to control breeding habitats and prevent mosquito bites. Below you will find more information on how mosquitoes are brought in, where they are prevalent within the United States, and how to prevent mosquitoes from getting into your homes and interfering with your travels. For more information on the Zika Virus, please visit our disease information page. Mosquitoes may be brought in and start breeding wherever there is shallow, stagnant water. Only a few mosquito species actually breed around permanent bodies of water. Outbreaks have typically occurred in countries where tropical climates are nearly year-round. 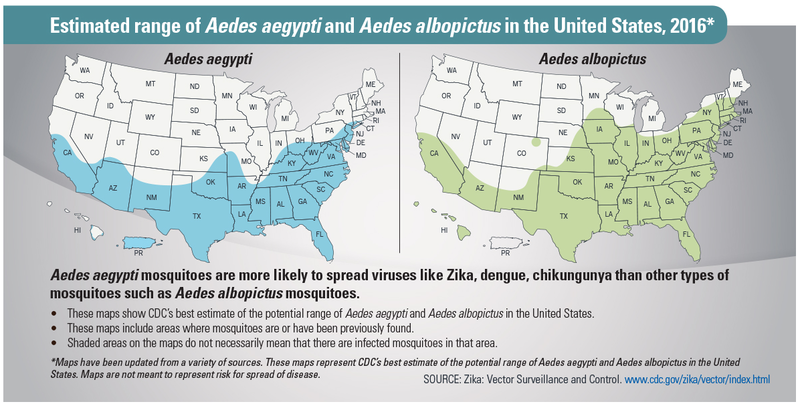 In the United States, Aedes aegypti and Aedes albopictus are concerning vectors for the spread of diseases like Zika Virus, Dengue, and Chikungunya. Depending on the species, the emergence of these diseases may vary per state. Zika, in particular, has recently risen as an emerging concern for all. Aside from being itchy and annoying, the bite of an infected female mosquito can spread viruses which cause disease. It is important to protect yourself, your family, and your community from mosquito bites by following guidelines provided by the CDC and the Virginia Department of Health. For homeowners, the best way to protect yourself from mosquito bites is to wear insect repellent – especially for children and pregnant women. Other ways to protect yourself from mosquito bites include wearing long-sleeved shirts and pants, when weather permits, as well as using air conditioning or making sure that all windows and door screens are in proper conditions. If you’re planning to go on a trip, make sure you do your homework before traveling. It’s important that you protect yourself when traveling by learning about the country’s health risks, what travel advice it offers, and how to stay safe. It’s also important that you wear an insect repellent that is registered with the Environmental Protection Agency (EPA). Repellents that contain DEET, picaridin, IR3535, oil of lemon eucalyptus and para-menthane-diol products provide long-lasting protection. Furthermore, make sure there is air conditioning and that all window/door screens are in proper condition wherever you stay. If you are not able to protect yourself from mosquitoes inside your home or hotel, sleep under a mosquito bed net. If you develop a fever, headache, rash, muscle, or joint pain after your trip, visit your healthcare provider right away. Make sure to tell them about your recent international travel. Visit the Getting sick after Travel webpage for more information. VDH and your local health department investigate certain cases of tick-borne diseases in Virginia. Identification of the tick can be used to rule out disease. See our identification chart for more information on ticks and the diseases they spread. *There are no labs in Virginia that currently test individual ticks for disease. Bed bugs have become a problem in the United States causing the health department to investigate reported cases at tourist establishments to determine if there is an infestation as well as offering guidance to others dealing with the problem. The resources below have been pulled together to help you and your community address potential bed bug issues. How to Sleep Tight and Not Let the Bed Bugs Bite!